Home / Asia / International / Singapore / Travel and Living / The Social Table at National Gallery Singapore- Take your favorite art home! The Social Table at National Gallery Singapore- Take your favorite art home! When you visit an Art gallery, you should ideally be spending time admiring the art work and reading about them and NOT keep taking pictures of the art, intruding others at the gallery and wasting your time. But then, if you want to take home with you the memories of the art gallery, there won’t be any other way than clicking some pictures of the artwork on display. 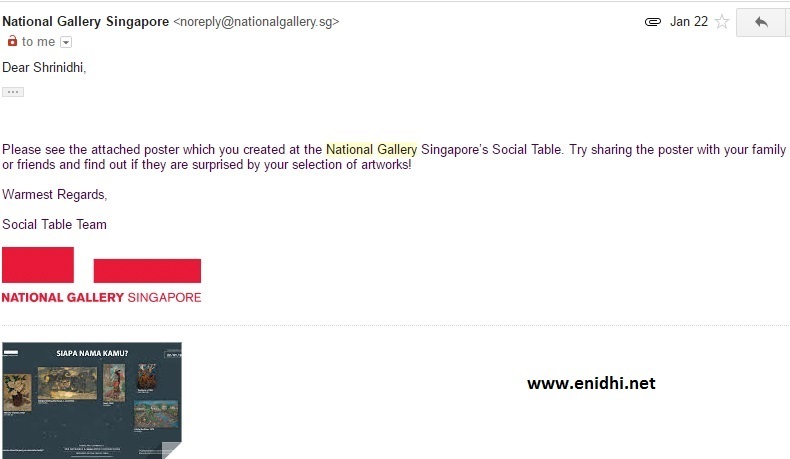 But Singapore’s National Gallery is uniquely different- it lets you mail yourself a copy of artwork that you saw and liked at the gallery. Sounds strange? Welcome to Social Table at the National Gallery Singapore! Social Table is located towards the exit of National Gallery, which is strategic, as you can stop by this table after exploring all exhibits and before leaving the building. If I knew about Social Table’s existence, I would not have clicked too many pictures. Anyway, below is what Social Table at Singapore’s National Gallery does. Social Table allows you to select photograph of one or more artwork that you have seen in the gallery, create a poster out of it and then get them emailed to your mailbox. This way, you can take home with you an image of various artworks that you liked, show it to family members or put them up on social networks at leisure. 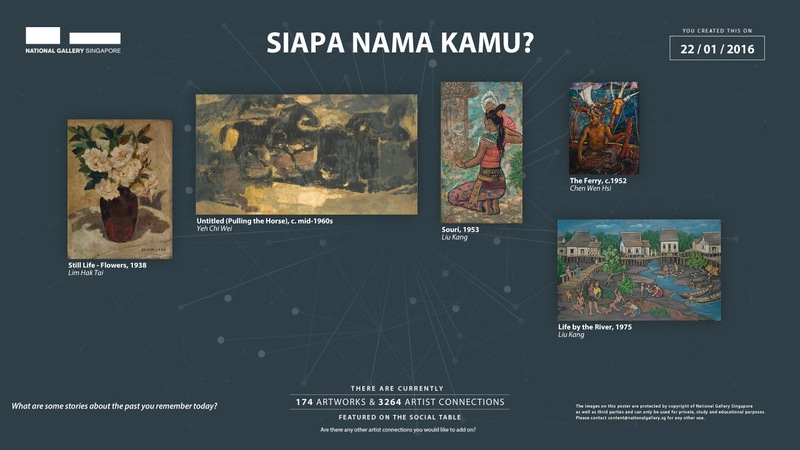 This is a wonderful initiative by National Gallery Singapore and needs appreciation. I mailed myself a few pics and within seconds it landed in my mailbox. Below is the mail and poster I got when I selected a few pictures and mailed them to myself. You can send them to your friends directly as well. You can decide size of a picture, positioning etc. This Social Table initiative at National Gallery deserves appreciation because lots of galleries around the world do not permit photography fearing that someone will copy the IP. If you notive above pictures carefully, National Gallery won't be sending you high resolution JPEG/RAW file of the art you have chosen. You will get a 1920x1080 size poster that is about 400kb in size containing artwork pics inside it- this is good enough for social sharing, showing it to family members etc, but can't really be used for any professional purposes, so one can't really steal much of IP through social table. So when in National Gallery Singapore, you can spend your time in a quality way taking close look at the art, instead of trying to take picture of everything in your mobile camera, disturbing other visitors in the process. Make note of arts you like the most, pick them up at the social table and mail yourself a copy. Social table is touch screen interactive and extremely easy to use. At a time several people can use the table- you don’t have to be on it exclusively or wait in queue for your turn. Good work Social Table Team at National Gallery Singapore! Won't it be nice if all art galleries provide similar service? Share your thoughts! Wonderful, Nice to read about Social Table.